Its official. The holiday season has begun. For most of us, that means stress, travel, shopping, parties, gifting and an extra dose of the family dynamics that keep us all on our toes. 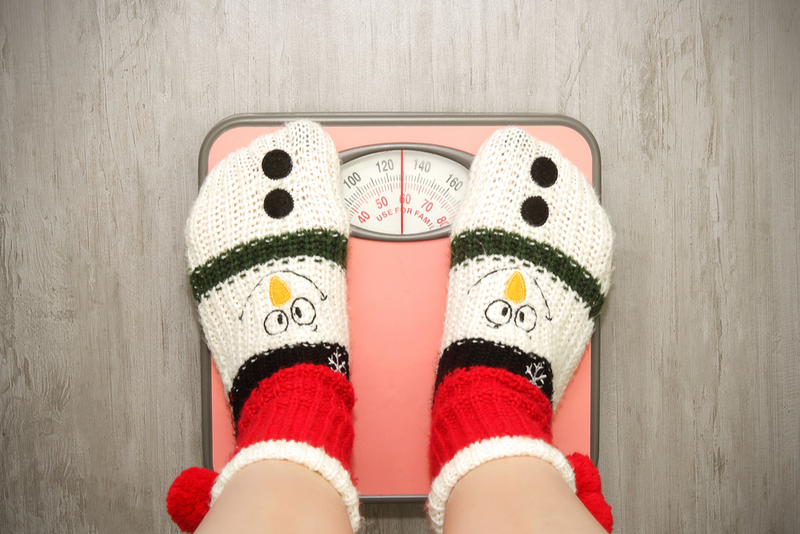 On average, Americans gain five pounds over the holidays. I would like to take this opportunity to share some holiday survival tips so that we can make it through this holiday season with an above average score of zero pounds gained! If you have any questions, don’t hesitate to call. Save $100 by purchasing a holiday training package. The package is 10 – 30 minute training sessions with a free health assessment for $250. Choose two areas of weakness and plan around them. For example, choose to stick to your workout plan and avoid any cheese trays from Thanksgiving to New Years. By recognizing and anticipating your primary weaknesses, you are more likely to stick with a plan. The holidays are hectic, it is important to continue to eat at normal mealtimes. Don’t try to ‘make up’ for bad eating by skimping at breakfast or lunch. This rarely works and puts most people into binge mode for the following meal. Instead, eat a light salad with chicken. The protein will keep you going. It is also helps to eat a high-fiber snack, like a handful of colorful veggies, mid-afternoon to avoid going to a party starving. Before you heap any party food onto your plate, scan the offerings on the table. Consciously take one “virtual” trip through the buffet to see what is being served. This will help you make better choices. And savor both the food you eatand the conversations you have with other guests; eating more slowly will help you be more aware of when you are satisfied and feeling full. Another strategy is to create a physical buffer zone that is a safe distance from the buffet. It’s normal to want to sample everything, but you may want to consider “saving” your calories for those favorites that come around only once a year. In other words, skip the mundane chips and dip, and go for a small serving of pumpkin pie this Thanksgiving. Keeping the holiday “cheer” to a minimum can save a tremendous number of empty calories. Limit your alcoholic beverages to 1–2 drinks per day. The same goes for those sweetened, nonalcoholic beverages; instead of sodas or punch, choose sparkling water and sugar-free drinks. The bigger the plate, the more people tend to eat. Most holiday buffets offer endless supplies of a variety of tempting foods; this can lead to us unknowingly consuming far more than their daily allowance of calories and fat. Opt for a small plate. Never leave the house hungry. Grab a quick 150- to 200-calorie snack, preferably a combination of high fiber and protein to stabilize blood sugar and assuage the appetite. Carry power snacks, such as nuts and dried fruit, with you while shopping or running errands. And always bring along a water bottle to stay hydrated throughout the day. Set a simple fitness and eating goal at the beginning of the holiday season, and monitor yourself. Stay on track by using a tool that works for you, such as a food log. Use the log to record what and how much you eat, and don’t forget to include anything you had at parties. Be vigilant! To remind yourself of the payoff, identify your own reason for staying on track (e.g., to maintain the lean muscle mass you worked so hard to get), then put it in writing and repeat it like a mantra each day. Remember the spirit of the holidays is to gather with those you love, not to consume food. In fact, simply heading into holiday parties with the mindset that you are seeking companionship—not cookies and cake—may help you eat less. Starting a weight loss program at the start of the season is a recipe for disaster. Attempting to diet in the face of holiday feasts can actually backfire, causing you to binge when presented with temptation. Instead, create a plan for success at the start of the season and stick to it.